Satisfy cravings for intense flavors with three-cup chicken, beef and ginger, and pork with shiitakes. These recipes are part of a new partnership between Christopher Kimball and the cooks at Milk Street and the Globe Magazine’s Cooking column. It turns out I was wrong about woks. Years ago I urged people to throw them out, but after a trip to Taipei in January, I’ve changed my mind. There I visited Shin Yeh, a white-tablecloth restaurant where the kitchen features a row of six huge woks, with massive burners and chefs who know how to use them. I watched a demonstration of three-cup chicken, a recipe that takes delicious advantage of high heat. When I got home, I grabbed my wok and stir-fried spinach, among other things. 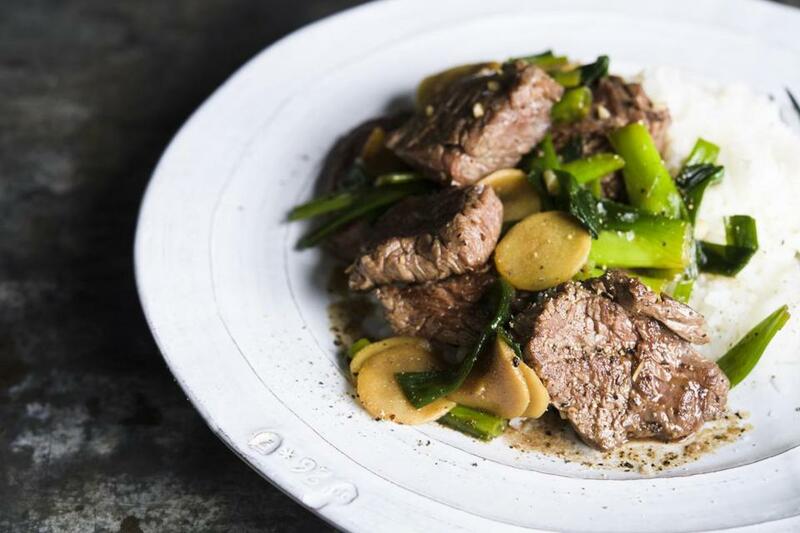 A skillet can get the job done, as in our recipe for Stir-Fried Beef and Ginger (in which we treat fresh ginger as a vegetable, not a seasoning), but woks are so much better for this sort of thing. The pan’s thin metal construction, gently curved sides, and broad surface area allow for rapid heating and quick searing, and foods don’t stew in their own juices. Taiwanese Three-Cup Chicken is named for the formula once used to prepare the dish: 1 cup each of sesame oil, soy sauce, and sake (rice wine). Not surprisingly, recipes no longer adhere to that ratio, but the name has stuck. Bone-in chicken legs that have been hacked into pieces are traditional for this one-pan dish; we opted for boneless, skinless chicken thighs for easier prep and eating. Though we prefer to use a wok, this recipe also works in a 12-inch skillet. Serve it with rice and steamed or stir-fried vegetables. Don’t begin cooking until all ingredients are prepared; the dish comes together quickly. And don’t stir the chicken for about 5 minutes after adding it to the skillet. This helps the chicken brown and develop flavor. 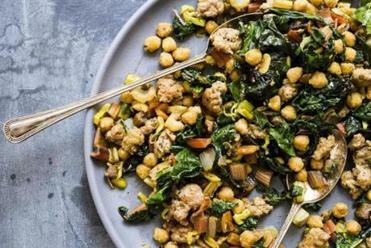 Keep it simple and speedy with garlicky chard and sausage with chickpeas, a Tuscan beef stew, or pasta con fagioli. In a small bowl, stir together the cornstarch and soy sauce, then stir in the sake and sugar. Set aside. Heat a 12- to 14-inch wok over medium-high for 3 minutes, or until a drop of water evaporates within 1 to 2 seconds. Add the oil and swirl to coat the wok. Add the chicken in an even layer and cook without stirring until browned, about 5 minutes. Add the garlic and cook, stirring occasionally, until it is well browned and softened, about 4 minutes. Add the scallions, serrano, ginger, and sesame oil, then cook, stirring constantly, until the scallions begin to wilt, about 1 minute. Stir the sake-cornstarch mixture to recombine, then add to the wok. Cook, stirring constantly, until the sauce is thickened, about 3 minutes. Off heat, add the basil and stir until it begins to wilt, about 30 seconds. 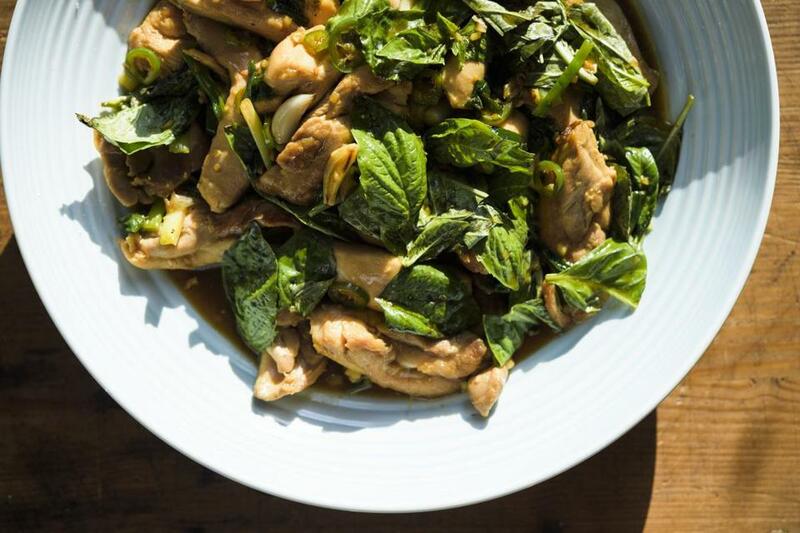 This is our take on saiko cha k’nye, a simple but bold stir-fry from Cambodia. The ginger is not just a flavoring here — it’s treated almost as a vegetable. A full cup of thinly sliced fresh ginger gives the dish substance; its spiciness and pungency is tamed by cooking. A mandoline makes quick work of slicing the ginger, but a chef’s knife works, too. We liked the flavor and texture of beef sirloin tips here, but flank steak also worked. Serve the stir-fry with steamed jasmine rice to soak up the sauce. In a medium bowl, toss the beef with ½ teaspoon each salt and pepper. In a 12-inch skillet over high, heat 1 tablespoon of oil until barely smoking. Add half the meat in a single layer and cook until well browned on both sides, 2 to 3 minutes total, turning the slices only once. Transfer to a plate. Repeat with 1 tablespoon of the remaining oil and the remaining meat. In the same skillet over medium, heat the remaining 1 tablespoon oil until shimmering. Add the ginger and cook, stirring frequently, until lightly browned, about 2 minutes. Add the garlic and cook, stirring, until fragrant, about 30 seconds. Stir in the scallions, fish sauce, and sugar, then return the meat and accumulated juices to the pan. Cook, stirring occasionally, until the liquid is slightly thickened and the ginger is tender, 2 to 4 minutes. Taste and season with salt and pepper. 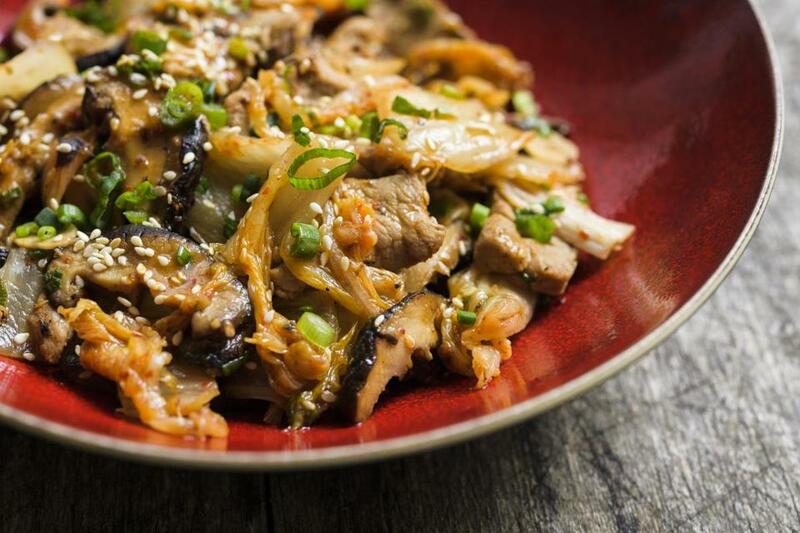 Sesame stir-fried pork with shiitakes. Don’t finely chop the kimchi. Larger pieces retain a slightly crisp texture and have more presence in the stir-fry. Serve with steamed short- or medium-grain rice. Cut the tenderloin in half lengthwise, then slice each half crosswise about ¼-inch thick. In a medium bowl, toss the pork with 1 tablespoon of the soy sauce and ½ teaspoon pepper. Heat a 12- to 14-inch wok over high until a drop of water evaporates within 1 to 2 seconds, about 2 minutes. Add 1½ teaspoons of grape-seed oil and swirl to coat the wok, then distribute half the pork in an even layer. Cook without stirring until well browned, 1 to 2 minutes, then stir and continue to cook, stirring often, until no longer pink, 1 to 2 minutes. Transfer to a medium bowl. Repeat using another 1½ teaspoons oil and the remaining pork. Set the wok over medium-high and heat 1 tablespoon oil until barely smoking. Add the mushrooms and ½ teaspoon salt. Cook, stirring occasionally, until the moisture the mushrooms release has mostly evaporated, about 4 minutes. Stir in the remaining 1 tablespoon oil and the garlic and cook until fragrant, about 1 minute. Return the pork and any accumulated juices to the wok and cook, stirring, until the juices evaporate, 30 to 60 seconds. Add the kimchi and kimchi juice, mirin, and the remaining 1½ tablespoons soy sauce. Cook, stirring and scraping up any browned bits, until the kimchi is heated through, about 3 minutes. Stir in the sesame oil, half the sesame seeds, and half the scallions. Transfer to a platter and sprinkle with remaining scallions and sesame seeds. Christopher Kimball is the founder of Milk Street, home to a magazine, school, and radio and television shows. Globe readers get 12 weeks of complete digital access, plus two issues of Milk Street print magazine, for just $1. Go to 177milkstreet.com/globe. Send comments to magazine@globe.com.